It's a good sign when, at the end of a demo, everyone is already retelling the events of the match they just played. This was the case after my PAX demo of Gigantic , a free to play, 5-on-5, “Don't call me a MOBA” multiplayer game from Motiga. Or it could be the moment you first come face to face with one of the titularly gigantic guardians, creatures that tower over all players and serve as either the thing you want dead on your opponents' team, or the thing you want to make sure stays alive on your own. My guardian, a giant owl who sounded strikingly like the Protoss from StarCraft, was squared off against a monstrous Chinese dragon. Saying that you're different, however, and being different are two different things, and I wanted to see whether Gigantic truly stood apart. The obvious big addition (both figuratively and literally) are the guardians themselves, who sit on the opposite endpoint of each map. As a team builds up kills and experience they are not just leveling themselves up but also powering up their guardian's attack meter, which when filled will cause them to set out and attack their counterpart. It's awesome to watch these giant beasts streak across the map and rip into their counterpart, which makes them temporarily vulnerable to human attack. This is important since the match doesn't end until one guardian dies. The constant push and pull had me running back and forth on attack and defense, scrambling back to my base to protect our guardian one moment, pushing past the enemies to lay some pain on their giant dragon master. The map's design was also very different than what comes to mind for traditional MOBAs. We played on a lost ruins environment, shaped like a crescent moon with each base on either tip. There was a single main path to get from one end to the other, but numerous secondary routes and side paths that would take you the long way to the enemy's guardian. Elevation definitely played a factor, as different ways could take you above or below the action, letting you sneak by or even rain destruction from on high. I was told that Motiga was currently designing around a dozen maps, each of which they want to feel unique. There are also no “creeps," though there are a select few AI-controlled monsters. These beasts can be summoned by players at specific control points, where they will hang out and give a variety of benefits to their team, like healing auras over sections of the map or the ability to see your opponents' location. Like Hi-Rez's MOBA-inspired game, Smite , Gigantic plays from a behind-the-back, third-person perspective. The characters I saw at PAX seemed to play pretty differently. I only got a chance to try out The Margrave, a black knight who suited my background of left-clicking on things a lot and never, ever thinking strategically. He had a number of abilities, including a charge, a jump attack, and the ability to deflect projectiles, as well as a special power which would pull enemies towards him. It felt like I was playing a barbarian from Diablo 3. But the guy playing to my left though looked to be having a very different experience. He was a ranged attacker, a big game hunter-looking guy equipped with a blunderbuss. His screen was more like a third-person shooter, with the camera slightly pulled back and an aiming reticule included. 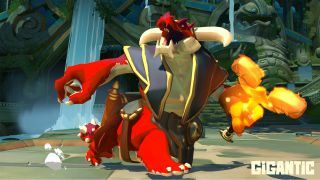 As the match hit its 15 minute mark, just as it was starting to drag, Gigantic changed gears and started the its endgame. We began spawning into a previously unreachable, much smaller rectangular section of the map, throwing us into the action in a matter of seconds as opposed to minutes, and both guardian's attack meters started filling much more quickly. Suddenly everything was chaos, with allies and enemies crashing into each other from all sides. With this late game change it took only another couple of frantic minutes before the match's end (which, despite my endless left-clicking, left me on the losing side). It was a really smart way to keep length tight, at about the 20 to 30 minutes. Phinney told me that Motiga hasn't yet hammered out the details of its business model, but reassured me that Gigantic wouldn't be pay to win. They were instead looking to build a strong community who would be willing to support the game. As I left the demo room with the other players laughing and retelling their favorite moments, I thought Motiga might be onto something.